1. Place oven rack about 5 inches from broiler. Preheat broiler to high. Place poblano peppers on rimmed baking pan and broil 4 to 5 minutes or until the skin is completely blackened and blistered, turning occasionally. Place poblano peppers in bowl and cover bowl with plastic wrap; let stand 10 minutes. 2. Meanwhile, in medium saucepot, combine milk, butter, 1/4 teaspoon black pepper and 1/8 teaspoon salt; heat to boiling over medium to medium-high heat. Gradually whisk in cornmeal until incorporated; reduce heat to low and cook 4 minutes, whisking occasionally. Remove from heat; stir in cheese. Cover to keep warm. 3. Remove skin from poblano peppers; pull off stem and cut lengthwise in half. With paring knife, scrape seeds, then cut into 1/2-inch pieces (about 3/4 cup). 4. In large skillet, heat oil over medium heat. Add shrimp and cook 3 to 4 minutes or until shrimp turn almost opaque throughout, stirring occasionally. Stir in garlic, remaining 1/4 teaspoon black pepper and 1/8 teaspoon salt, and poblano peppers, and cook 1 to 2 minutes or until shrimp turn opaque throughout, stirring occasionally. 5. 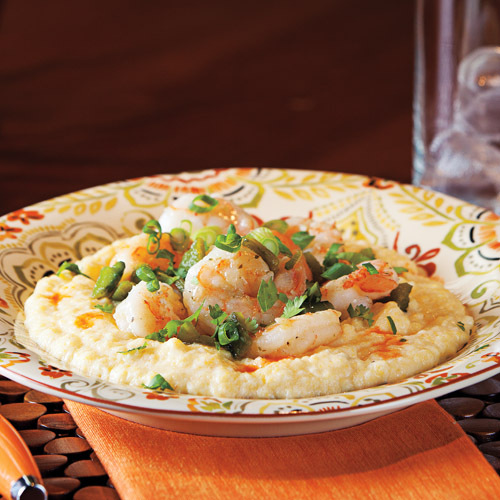 To serve, spoon shrimp mixture over polenta and sprinkle with hot sauce. Garnish with green onions and cilantro, if desired. The finer the grind of the cornmeal, the less cooking time is required. Check specific package labels for cooking time. Try using jalapeño peppers in addition to the poblano peppers for a spicier dish. Peppers can also be roasted directly on gas stovetop over high heat until skin is blackened and blistered, turning occasionally with tongs.